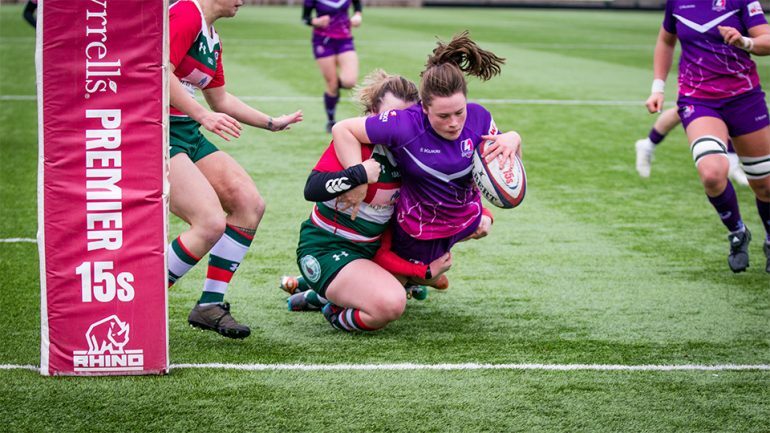 It was a clinical Lightning side that took to the pitch at Loughborough this afternoon, putting 14 tries past the Firwood Waterloo defence, securing a 76-8 bonus point win. Lightning set the pace from the get-go, pressuring the Waterloo defence, taking only minutes for Ellen Ramsbottom to cross the line. Waterloo responded quickly choosing to take the three points closing the gap on Lightning to 7-3. A flurry of tries from Lightning, including two from O’Donnell, took Lightning to 44-3 at half time. Looking to close the game out early, Katy Daley-Mclean placed several cross- field kicks to Bethan Zeidler who scored a hat-trick in the first few minutes of the half. Lightning’s set piece dominated all over the pitch with Sarah Hunter crossing the line from a turned over scrum. Clinching her second try of the game Carys Williams weaved her way through the Waterloo defence, taking Lightning’s lead to 64-3. Returning from injury, a fantastic first touch saw Rachel Malcolm power over the line to extend Lightning’s lead to 69-3. Not going down without a fight, Waterloo crashed through the Lightning defensive line and dotted down between the posts. A final try in the last play of the game by Bethan Zeidler, saw Lightning finish a very clinical performance 76-8. Lightning’s next home match is on the 23rd March against top of the table Saracens – it’s set to be a stormer!